Brown’s Private Cabo Catering Services offer Chef services in Cabo in private villas and condos and you can couple it with bartender and waiter staff, they will make your vacation so enjoyable you won’t regret it! Our waiters and bartenders are bilingual, well-trained and professional, they will provide an exceptional service for you and your party. Enjoy our famous Mango margaritas, Piñas Coladas and Mojitos! And for your kids we can do special smoothies and shakes!. Highly recommended to have the Waiter and/or Bartender because your Chef in Cabo is going to be very busy cooking and decorating the food for you, and your waiter/bartender can be making drinks for you and setting a very nice table, so everything will be just perfect! 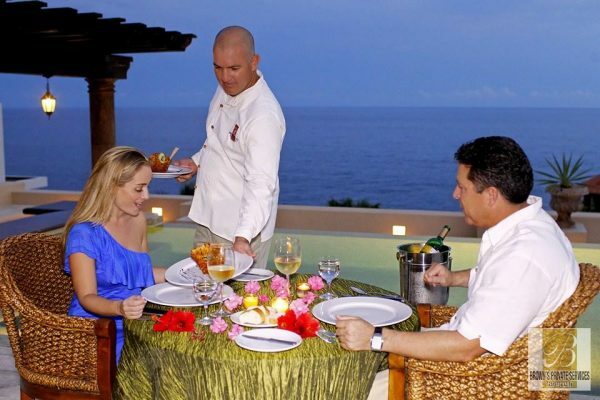 We also have dozens of waiters and bartenders for a cocktail night, weddings, events and any event in Los Cabos! Serve the dishes to the clients. Serve the drinks to the clients. Put all the dishes in the sink. Wash the glasses and cups. Put all the glasses in their correct place. Put the napkins in the laundry room. Note. A waiter or bartender is minimum 3 hours required.